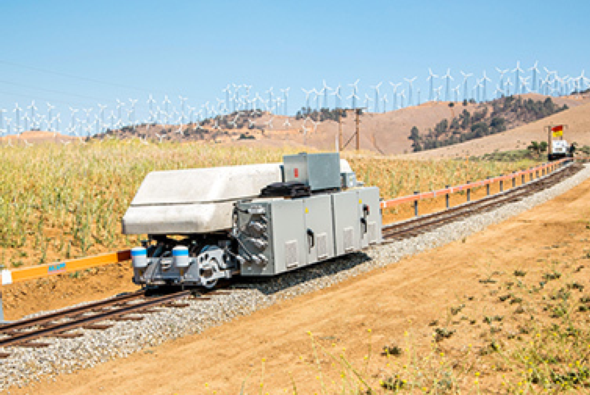 Advanced Rail Energy Storage (ARES), based in Santa Barbara, California uses modified railway cars rolling downhill on a specially built track to release energy and off-peak electricity to pull the cars to the top of a hill. The ARES system requires specific topography but its founder and primary inventor, William Peitzke, says ARES uses 100-year-old technology which delivers more power for the same height differential with a round-trip efficiency—the ratio of energy out to energy in—of more than 85%, compared with 70-75% for pumped-storage hydropower (PSH). Furthermore, ARES has a much wider geographic scope than PSH since it does not require water and has far less negative environmental impact (no need for drilling or flooding). Peitzke co-founded the company with San Diego engineer Matt Brown and hired James Kelly, a retired Southern California Edison executive, as CEO. ARES has raised $25 million as of July 2015. Pumped-hydro facilities typically take advantage of natural topography, and are built around two reservoirs at different heights. Off-peak electricity is used to pump water from the lower to the higher reservoir, turning electrical energy into gravitational potential energy. When power is needed, water is released back down to the lower reservoir, spinning a turbine and generating electricity along the way. PSH accounts for more than 99% of bulk storage capacity worldwide: around 127,000 MW, according to the Electric Power Research Institute (EPRI), the research arm of America’s power utilities. This first full-scale setup can store up to 12.5 megawatt-hours (MWhr) of energy that can produce 50 megawatts (MW) at a moment’s notice. As a rule of thumb, every MW is equivalent to 1000 homes; this is enough to power 50,000 homes for 15 minutes. Nevada is a particularly good place for ARES since its landscape features the long, gentle slopes the trains need to operate at peak efficiency. Based on results at the 800 feet long Tehachapi test facility, the trains run best on grades between 6% and 8% and at speeds between 16 and 20 mph. ARES has moved a 6.5 ton rail car up a 15-inch gauge track with energy produced by Tehachapi Mountain Wind Farm. In Nevada and other dry plains around the world, CEO Kelly expects to find slopes up to eight miles long. The longer the track, the more power the system can store. What are the technical specifications of ARES? ARES’s technology uses heavy rail cars that are pushed to the top of a grade using excess power from renewable energy plants or when electricity demand is low. Then, when the wind drops, the sun stops shining, or electricity demand rises, the rail cars are released back down the hill, generating electricity through regenerative braking. The cars are Australian ore trains with all extras stripped off, each one the equivalent of a 2 MW generator. When storing power, the trains haul 230 tons of rock and cement up a hill of about 3000 feet high. They can leave the loads at the top of the hill and go back down and get more, to increase capacity. When the system is not in use, fully loaded trains wait along the track. When power is needed, they start rolling downhill with the heavy load providing most of the inertia. The electric motor runs the other way, and power is transmitted to the grid. The system can ramp up in 5 to 10 seconds, which is not as fast as flywheels or batteries, but faster than a simple cycle gas turbine. If the system has to run for a long time, empty locomotives drive back up the hill on a second track and pick up a new load of stone. What are the future plans and challenges present? ARES has eyes set to more ambitious goals. Most of the technology was already there, meaning it can be built with parts already mass-produced by the rail industry. Large systems will require multiple parallel tracks up to eight miles long. ARES has a round-trip efficiency of 85%, but the number can rise as the company optimizes its equipment. They expect to have an operational 50 MW project selling into the California grid’s ancillary services market via the Valley Electric Association cooperative utility by the end of 2017. With a permit received, ARES is in partnership with Nevada’s Valley Electric Association (VEA), the project would access the regional electrical grid through VEA owned and operated transmission facilities and receive and respond to commands from the regional transmission grid operative, California Independent System Operator (CAISO). ARES is growing as well — the ARES Nevada project will create 100 to 125 full-time local jobs during an eight month construction phase, and anticipates 16 full-time positions once in operation. The project’s life is expected to span 40 years or more with only routine maintenance. ARES is not just focused on Nevada. Currently, ARES is already under talks to build similar projects across the country — notably Hawaii, the northeast, and the southeast — and recently hosted an event where they talked to six different utility companies with promising results. States such as Hawaii have renewable goals they must reach and they cannot expect to reach them without energy storage pairing up with renewable energy. According to Francesca Cava, the limitation is not geography since the slope is much more gentle than most people expect. Immense flat plains like Kansas would not be ideal but even a slight slope enables the rail cars to be used. Internationally, Israel, China, and Europe have already expressed interest in ARES. Furthermore, ARES is not standing still with its technology. Aside from market expansion, it is also talking to European train designers to renovate their existing trains for the purpose of energy storage. Those trains such as the ones in Switzerland are much more efficient and can run at steeper grades than the basic ones ARES currently are using. The biggest challenge facing ARES is not technological but financial. Energy storage is still in its nascent stages and ARES had to look for private investors. Francesca Cava noted that existing financial institutions don’t support it but they will in the future with a storage energy purchase agreement, similar in format to the existing power purchase agreement (PPA) which the renewable industry has adopted. Further information on ARES can be found by contacting Francesca Cava, Vice President of Operations, at francesca@aresnorthamerica.com or (805) 966-6312.